I have this wonderfully decked-out laptop that is with me all the time (Oh, the things you can do with bumper stickers!). Because “I AM SECOND” is plastered all over it, I naturally get a lot of questions. “Who’s/What’s first?” “Why are you second?” “Shouldn’t it be I Am Third?” or my personal favorite (and this actually happened to my friend Amy), “Honey, you aren’t second to anybody, and don’t let anyone tell you differently!” As far as FAQ’s, I thought this would be a great place to start since it revolves around who/what I Am Second is about. So who/what is first? I’m still kind of amazed that I get asked this question by people who have visited the site. I forget that I watch videos with the knowledge that Christ is how each of the stories is tied together. But not everyone gets that immediately. To explicitly answer the question: Christ is first. Why am I second? This is different for every person. (So if you are second, this would be where you share your story.) For instance, according to Pete Briscoe in his video, “Christ is first because he is magnificently first in everything… it is simply my recognition of who he is.” For me, it’s because my earthly father was not always there for me, but I was able to find a perfect father in God. Every person has their own reason of why they are second. Shouldn’t it be I am Third? 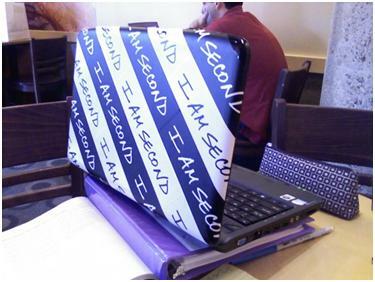 “I Am Second” was designed for people who have never thought of putting something first in their lives other than self. The idea of placing something else in first place is a new and significant bridge to cross. “I Am Second” highlights the first decision one must make to live a life in harmony with God’s will – first choosing to be second before understanding and accepting God’s command to place others ahead of yourself. One must be second before they can become third. So there’s a few answers for now, hopefully that’ll either answer your question, or help you answer questions when you’re asked. If you’re still confused on any of that, please let me know and I’ll try to further explain. That’s awesome! What a great way to get the word (and the Word) out! I’d love some bumper stickers and maybe even a t-shirt! Are they available?